The controversial North Carolina Farm Act was sent to Gov. Cooper today after the state Senate concurred with the House amendments. The bill has attracted intense opposition from a variety of parties, including environmental advocates, rural advocacy groups. trial lawyers and even some Republicans. Last night, veteran GOP lawmaker John Blust of Guilford County delivered a stem-winder of a speech decrying the bill, in which, among other things, he blasted his fellow Republicans for rushing the bill through. Click here to see the speech. S711 eliminates property rights that pre-date North Carolina statehood and strips neighbors and communities of access to the courts in an effort to protect a single industry from liability. The bill constrains nuisance challenges so tightly that the only example of a viable claim the bill sponsor could imagine is a lawsuit following the complete abandonment of a farm by its owners. The communities surrounding intensive hog farms in North Carolina are already disproportionately burdened based on their race or ethnicity. In January 2017, the US EPA expressed its concern that the impacts of animal agriculture, coupled with inadequate state remedies, violate Title VI of the Civil Rights Act. Your Administration has shown leadership on this issue and recently settled negotiations resulting from that EPA letter. S711, section 10 would entrench the same unequal protection that concerned the federal agency, and is inconsistent with the values and direction of your Administration. Even viewed from the perspective of H467’s supporters, S711 is unnecessary. There have been no nuisance suits filed against any agricultural operations in North Carolina other than the suits against Smithfield in a number of years. 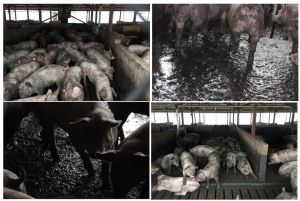 Furthermore, it is our understanding that no lawsuits filed after the effective date of H467 have reached a judgment against Smithfield or any other farm or integrator, and the ongoing lawsuits are not subject to either H467 or S711. Thus, even if one believed it was important to limit nuisance claims against the corporation, there is no evidence that S711 is needed to reach that goal. Because the bill precludes lawsuits that have not been filed as of the date of the bill’s enactment, it effectively ‘takes’ the accrued but as yet unfiled claims of an unknown number of neighbors. Under Rhyne v. K-Mart Corp, 258 N.C. 160, 594 S.E. 2nd 1 (2004), S711 may leave the State responsible for compensating each of these residents for their lost claims, imposing an unknowable financial liability on state government. Cooper has 10 days to act on the bill, which means a veto would have to happen by Monday, June 25. Please veto this absurd bill.